After weeks of rain and moss growing on my arms, it finally cleared enough in this state (Washington) to try out my new 1911A1 Springfield Mil-spec Basic. I picked the moss off and hiked into the Cascades. The reason for the hike is my range was closed and I’ve been waiting weeks to shoot this pistol. Tired of looking at it on my bench. So I packed up and went into the hills. After hiking a few miles in, I found a good safe place to shoot. Set up my target 35 feet in an area all the distance I could measure. And pulled that 2 1/2 pounds of steel to begin what I’ve been waiting for. I packed up 100 rounds of FMJ plus various hollow points such as Lawman, Federal, and Star. Also brought along some old government magazines to test. Out of the box test, only additions were a good cleaning, lube and shok-buff. At 35 feet, I shot 2 inch groups in a Weaver stance. I thought, “not bad for me!” Next, I loaded up with hollow points and not a misfeed. I continued to shoot FMJ and again, no problems. Old magazines, no problems. I was happy. Shot 3 kinds of hollow points and 100 or so standard FMJ loads. Some of you remember my previous post regarding the Springfield 1911A1 Mil-Spec Basic. The pistol came with high profile 3 dots sights, throated, tight slide to frame fit, beveled magazine well, ramp looked very good, lowered and “flaired” ejection port, the forged barrel, slide and receiver are nice. Custom work? Whatever you want. 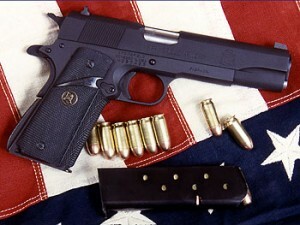 November issue if GUNS magazine has a good article on Wilson custom guns using the 1911A1 Springfield as a base gun. Out of the Colt’s, Glock’s, Makarov’s, S&W’s, and a Beretta I’ve owned, the Springfield no question is one of the best out of the box. Long term? Only time can tell. All I’m going to do is have a AMBI safety installed (left handed) and some trigger work done.